Most experts believe that the African HIV epidemic is largely sexually transmitted. Hence “be faithful and wear a condom” is good advice. But what about non-sterile scarification, tattooing, or medical injections? Advice to “avoid unnecessary injections or surgery” is routine for foreign aid workers, but if spread more widely might discourage immunisation. Could it be that experts have not taken this route sufficiently seriously? John Potterat, claims just this. He argues that there has been a public health conspiracy to downplay HIV transmission by needlestick, and not just for fear of discouraging immunisation. He claims that exaggerating heterosexual transmission helped unlock Western funding in the late 1980’s and has kept the money tap open ever since, to the detriment of the health of Africans. He has summarised the evidence in a recent paper available here. For those who have trouble accessing it I’ve uploaded a copy here. Potterat Enigma of HIV in Africa It makes interesting reading. He asks, why is the African epidemic so much worse than the Western one, which has largely spared heterosexual people unless they also inject drugs? Why does the pattern of infection in Africa not follow that of other sexually transmitted diseases? He says the unspoken assumption that Africans are uniquely promiscuous has been refuted again and again. Obviously some people must have been infected by needlestick. The issue is how many? A few occasional cases? Or a substantial fraction, sufficient to drive the epidemic? Apparently no-one knows. Because, no-one has done the sort of careful studies that would measure the rate. For Potterat this is a scandal. It’s a scandal if people are getting avoidably infected by traditional healers, or with dirty needles in unsafe health centres, and no-one is doing anything to prevent it. 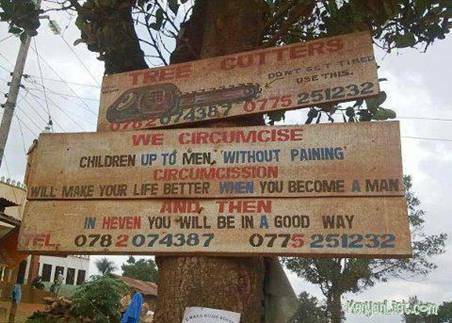 It also matters when we come to consider circumcision. If infection really is all sexually transmitted, and if male circumcision reduces transmission by this route, then mass voluntary circumcision may make sense. But if a substantial proportion of transmission is through needlestick, the circumcision procedure itself might simply be another opportunity for infection. After all, Western aid workers all carry clean needles and syringes for when they unexpectedly need an injection or minor procedure. And who can blame them? Would you want a procedure in this clinic? Potterat is right. It is a scandal that needlestick infection has not been better studied. Until it is we can never be sure that surgical programmes, such as the mass male circumcision ones, will not do more harm than good.